Sniffing out the best deals for you! With almost thirty years of experience supplying oilfield equipment, Four Corners Supply, Inc. is the cornerstone of the oilfield supply industry. Founded in April 1984 by Nancy Hansen, Four Corners Supply Inc. provides oil and drilling companies and their staff with a custom service of new and used oil field parts and repair services to keep their project running smoothly. We can assist in parts and service to drilling equipment, work over rigs, roust-a-bouts, field pumpers, welders, and farmers. Specializing in bottom hole pump repair, Four Corners Supply has dedicated a section of their Oilmont shop to building or repairing pumps so your company’s downtime is minimal. Across Montana, Four Corners Supply has two locations: a store in Oilmont, MT, and the main office in Worden, MT. We have a combined experience of over 130 years in the oil industry and the knowledge to assist you in any project. Mike Lingle joined our team in 1985 and manages our Oilmont store. He is proficient in bottom hole pump repair and can find anything you need for the oilfield. He can also help with non-oilfield items as well. 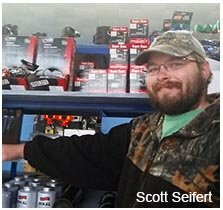 Scott Seifert is also at our Oilmont location. Scott has well servicing experience and has been with us since 2006. So, no matter the play, Four Corners Supply has the experience and knowledge for any company, any day, any time. In fact, Four Corners supply is on call 24 hours a day and 7 days a week, just call one of our stores for assistance. Four Corners Supply also carries a full stock of new and used parts, and if what you need isn’t on hand, we will order it in for you. And for all the personal needs of the roughnecks, we carry hard hats, liners, hand cleaners, gloves and much more. Four Corners Supply is a premier supplier of oilfield equipment. If we don’t have it, we’ll find it.